Losing A Cherished Pet By Accident. It is a deep sadness that takes hold of our hearts when our beloved 4 legged friends grow old. Brought down by their advanced age, we end up having to say Goodbye to them before we are ready too. But losing a furry Friend through an accident or sickness before their time is double hard. This story about a little dog called "The Fat Man" is in hopes that those that read it will remember it and be extra careful of the unknown. His story begins at a dog rescue. M.M not only adopted him, she set out to see that he was happy and healthy and would never go unloved or uncared for again. His teeth were in terrible shape and she had the expensive Dental Work done. By the time she was finished, the little Golden Colored dog was in fine form. No longer in pain from rotting teeth, neutered, groomed and ready for a life time of being spoiled. Due to his ability to consume vast amounts of food leading to a chubby body, he was given the fond name of "The Fat Man"
He roamed her acreage with pride. Along with her whole menagerie of animals, he lived a life of freedom and happiness. His favorite place of all was the living room couch. And the blanket on it was where he loved to roll around and end up on or under that blanket. His favorite blanket was to be the death of him. M.M. returned home from a busy day at work to a devastating, sickening sight. The Fat Man was dead. He had died in agony. You see, like some of my own favorite dog blankets, the thick hem of it had come loose. Forming a loop. While rolling around on it, he had gotten his head through the loop of the blanket. Struggling to free himself only made it worse. The strip of hem tightened and tightened as he struggled. Cutting off his wind. Choking him. His frantic struggles would have become less and less as he slowly choked himself to death. M.M. was herself almost destroyed finding him. Her compassion for all God's Creatures and this happens? So now, let us not ever forget "The Fat Man". Let us check the hem on all our blankets. Take a pair of scissors and cut the raggedy hem off or sew it back in place. I personally went through my stack of doggie blankets and did just that. I did it for him. 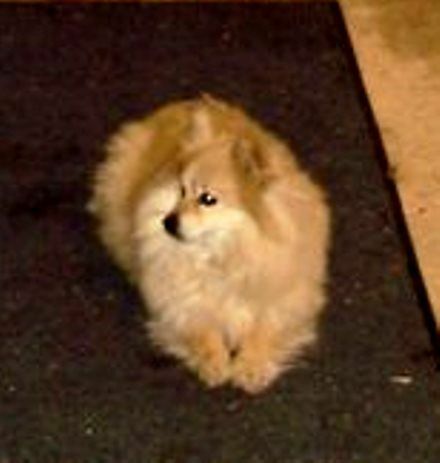 The chubby, golden colored little dog known as "The Fat Man". Thank You M.M. for sharing your story. Bless You. Gayle, owner of this website.